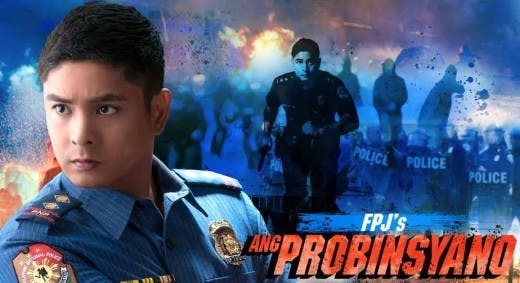 “FPJ’s Ang Probinsyano” secured the top spot last Friday (July 13) with 43.1%, compared to “The Cure” (17.3%). 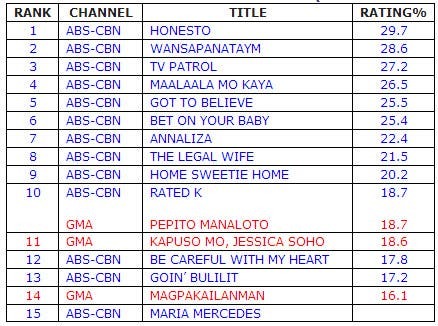 “TV Patrol” brought news to more viewers last Friday (July 13) as it hit 33.1%, while “24 Oras” only got 22.1%. Meanwhile, “Your Face Sounds Familiar Kids” ruled weekend programming with national TV ratings of 33.4% last Saturday (July 14) and 32.4% last Sunday (July 15). The touching story on “Maalaala Mo Kaya” last Saturday (July 14) recorded a national TV rating of 30.1% versus “Magpakailanman” (20.4%). “Kape At Salita ‘Sis. Rissa Singson-Kawpeng’” (1.2%) vs.